When you add a modern page to a site, you add and customize web parts, which are the building blocks of your page. This article focuses on the Microsoft Stream web part. The Stream web part will display a Stream video or channel on your published page. Additionally, videos will also display directly in the SharePoint mobile app for iOS and the SharePoint mobile app for Android. 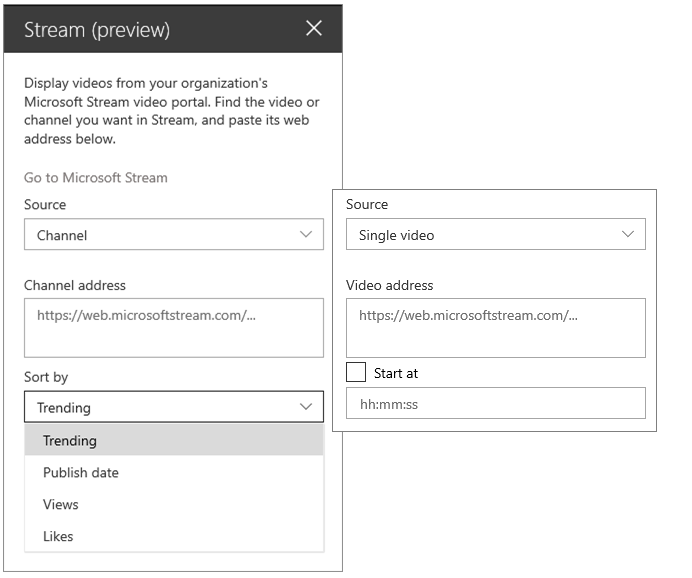 Microsoft Stream is a new video service that uses the power of intelligent enterprise video to enable knowledge sharing, easier communication, and connectivity in a secure enterprise environment. Microsoft Stream is the successor to Office 365 Video; however, the two services will co-exist during the transition period. Both are built on Azure Media Services and use the same streaming video technology, allowing playback at scale across any device. For more information on how Stream works, see the Microsoft Stream web site. Hover your mouse above or below an existing web part or under the title region, click , and then select the Stream web part. Click Add video or channel. In the toolbox on the right, select your source (a single video or channel), paste the video or channel address. Optionally, you can set a starting point for a video or, for a channel, you can choose to sort videos by Published date, Trending, Likes or Views. When you're ready, save and publish your page so that others can view it.